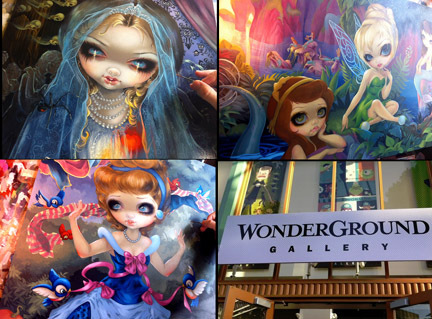 PLEASE NOTE: We (Jasmine & Matt) will be leaving for our upcoming Disneyland & UK art shows shortly. If you have any unpaid orders or want to place new orders you'd like shipped before they leave, please get your orders/payment in before NOON EST on Monday, October 14th. Our "fixed price" store items in our Strangeling eBay store and Strangeling.com will go into "vacation mode" but will magically reappear on October 30th upon our return. StrangelingEmporium on eBay and our Etsy store will remain open as usual. Keep an eye out for our Strangeling eBay auctions herethough - new auction-format listings will be popping up every day while we're gone, and will ship upon our return - lots of great "penny auctions" for new art daily! Original is AVAILABLE - email JasmineToad@aol.com if interested! Framed Original Painting is AVAILABLE - email JasmineToad@aol.com if interested - payment plans available! "Microcosm: Galaxy" is the fifth painting in my Microcosms series - delving into the theme of Alchemical microcosms - miniature life and worlds created in glass jars or beakers. This installment features a lovely but rather melancholic maiden cradling a jar containing what appears to be an entire galaxy! A world within a world indeed. If you look in her hair you will see an ornament in the shape of a sextant - an astronomical navigation device. My own original acrylic painting - if you are interested in the original painting, email me at JasmineToad@aol.com with the subject line "Microcosm: Galaxy" - collectors will be contacted in the order in which emails are received - she comes in a fabulous frame! Lt. Ed. Canvas Prints are HERE (please note, this listing will disappear Sunday evening when our Strangeling eBay store goes into "vacation mode" but will reopen October 30th and become available again. The #01 Lt. Ed. Canvas auction will pop up HERE Sunday night after 6:00pm EST. Feel free to bid as usual - the auction will run while we are out of town and we will ship on October 30th. Jasmine is coming to the UK! 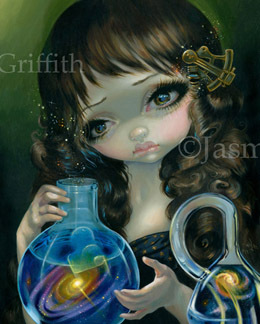 October 26th-27th (Samhain) - Jasmine will be there both days with art, merchandise, books & more. She will be debuting her new line of original paintings called "Tiny Treasures" - miniature (and affordable!) 3"x3" square acrylic paintings. She'll also be bringing special 4"x6" mini prints (only 2 £ each! ), and will be a booth neighbor to Paul at StrangelingUK who will be bringing even more Jasmine stuff! The Faery Fayre is FREE to attend, and cash & all major credit/debit cards accepted for purchases.